Most workers suffered a loss in real earnings in the past year. Wage declines were greater for non-Hispanics than for Hispanics. 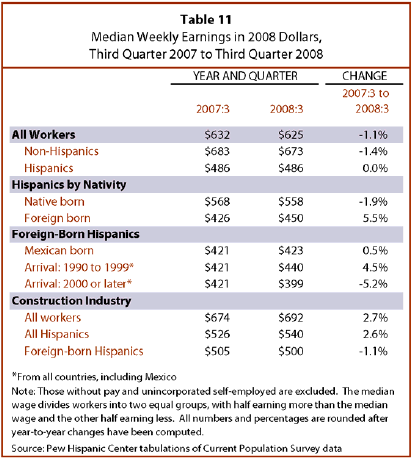 Indeed, median wages for foreign-born Hispanics are estimated to have increased since the third quarter of 2007. Although this appears paradoxical in light of the ongoing recession, it may simply be a result of low-wage immigrant workers exiting the labor force. At the same time, median earnings of recently arrived Latino immigrants decreased sharply from the third quarter of 2007 to the third quarter of 2008. In the third quarter of 2007, the median weekly wage in the economy was $632 — half of workers earned more and the other half earned less (Table 11). The median earnings of non-Hispanics — $683 — were higher than for all workers. However, Hispanic workers earned much less in the third quarter of 2007 — $486 per week (all wages expressed in third quarter, 2008 dollars). Real wages of Hispanic workers were unchanged from the third quarter of 2007 to the third quarter of 2008. However, weekly wages for non-Hispanics fell to $673, a loss of 1.4%. For all workers combined, wages dropped to $625, 1.1% less compared with the third quarter of 2007. Losses incurred by native-born Hispanics were larger than average. Their weekly wage decreased from $568 in the third quarter of 2007 to $558 in the third quarter of 2008, a loss of 1.9%. In sharp contrast, wages of foreign-born Hispanics are estimated to have increased 5.5%, from $426 to $450, over the same period. That gain, however, may be illusory. As noted above, there are indications that some Latino immigrant workers have exited the labor force in the past year. If those departing from the labor force were low-wage workers — a fairly likely outcome in a recession — that would raise the median wage observed for foreign-born Latinos who remained in the labor force. Support for this possibility comes from the divergent trend in wages for two groups of immigrant Latinos — those who arrived between 1990 and 1999 and those who arrived in 2000 or since. The median wage of the former group of workers increased 4.5% from the third quarter of 2007 to the third quarter of 2008, while the median wage of the more recent arrivals fell 5.2%. The key difference between these two groups is that the working-age population, labor force and employment of Latino immigrants who arrived between 1990 and 1999 has decreased in large numbers since the third quarter of 2007 (Tables 4 and 8 above). Median wages in the construction industry are also estimated to have increased since the third quarter of 2007. Median wages for all workers in construction were 2.7% higher in the third quarter of 2008 and median wages of Latinos in construction were 2.6% higher. This trend may also be due to a disproportionate number of departures of low-wage workers from the industry.